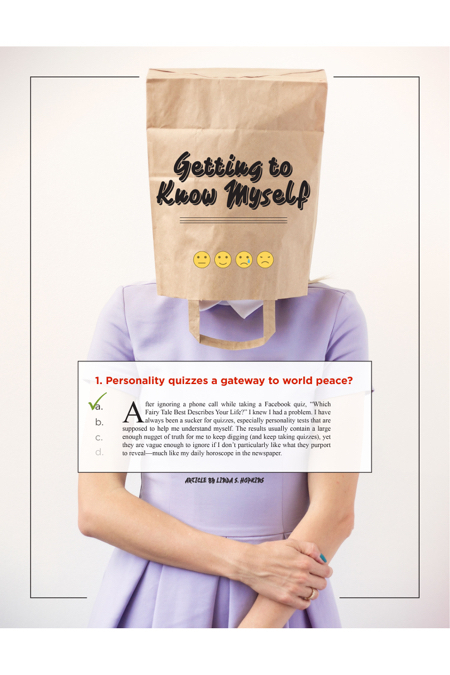 Hilton Head Magazines: CH2/CB2: Getting to Know Myself:Personality quizzes a gateway to world peace? After ignoring a phone call while taking a Facebook quiz, “Which Fairy Tale Best Describes Your Life?” I knew I had a problem. I have always been a sucker for quizzes, especially personality tests that are supposed to help me understand myself. The results usually contain a large enough nugget of truth for me to keep digging (and keep taking quizzes), yet they are vague enough to ignore if I don’t particularly like what they purport to reveal—much like my daily horoscope in the newspaper. Thanks to Facebook, I have been discovering more fascinating facts about myself every day. Who knew you could tell so much about a person based on what word she sees first and whether she prefers a picture of a sunset, a Ferrari, or a butterfly? What’s even more remarkable is that some of the quizzes don’t even require me to answer questions or make selections. I just log in with my Facebook account for instant analysis. It’s a bit unnerving to realize what Facebook can ascertain from my collection of cat videos and inspirational quotes. For all the current intrigue, personality quizzes are not new. In fact, I used to rip them out of my mother’s Good Housekeeping magazines, turning later in life to Cosmo and Glamour for my character assessments. But now I can access all this wealth of self-knowledge online, where quizzes are popping up like tourists in minivans at Coligny Beach Park. This recent wave of quiz popularity can be traced to Buzzfeed’s New York City headquarters, where a team of about 100 content creators produce one to five quizzes every single day. Imagine that! It is someone’s real job to come up with this stuff. According to reliable sources (think Google), the most popular quiz—“Which State Do You Actually Belong In?”—has generated about 41 million page views. Surely whoever devised that one got a bonus, or maybe a vacation to his or her state of choice. Beyond my obsession with Facebook quizzes, I genuinely do find value in self-excavation, whether it is in a psychologist’s office, at lunch with a friend, or home alone with my own thoughts. During a recent period of sadness over some personal losses, a friend noticed a change in my usual cheerful demeanor and wanted to help. She offered to connect me with an intriguing and insightful woman, Dr. Zannah Hackett, founder of the Y.O.U. Consulting Group, The Y.O.U. Institute, and the innovator of an instrument by which she helps people understand themselves. It’s called ULT, The Ultimate Life Tool®. Hackett is not just another brilliant kid working for Buzzfeed to keep us entertained. She is a serious investigator and educator with a deep understanding of science and nature, advanced degrees, plus 30 years of career experience and research in the field of cutting edge human assessment technology. I took her online test with a healthy skepticism and came away with a far greater understanding of myself than I ever believed possible. Without consulting my astrological chart or my Facebook profile, and without claiming any psychic abilities, based on my test results, she explained many aspects of my personality and character that made perfect sense, including what role my physicality plays in determining what I am; why I attract certain kinds of people; what kinds of relationships are unsustainable for me; why I’m perfectly comfortable in some environments and situations while others are intolerable or can only be taken in small doses; and why my energy level was out of balance. By the end of the private, 90-minute telephone consultation with Hackett, I had a brand-new view of myself. Now, with a clearer understanding of my true nature and where my perspectives originate, I can move forward in life with greater confidence in who and what I am. Another noteworthy personality assessment, and perhaps the most highly regarded, is the Myers-Briggs Type Indicator (MBTI), which uses four indexes to categorize individuals into one of 16 personality types. Hundreds of studies have proven the instrument to be both valid and reliable, and millions of people worldwide have taken the test each year since its first publication in 1962. It’s widely used in the workplace and in organizational settings and can be helpful in improving relationships, evaluating learning styles, choosing careers, and more. Whether you believe in these kinds of assessments or not, MBTI is a fun one to take, if for no other reason than initiating cocktail party conversations. Whatever you think about Facebook quizzes and personality tests in general, they can be a form of entertainment or a starting point for self-discovery. At minimum, you will begin to see that people behave differently because they view the world differently. And if a quiz can help us understand that our conflicts and frustrations may be the result of our diverse viewpoints, therein lies hope for greater tolerance and a more peaceful planet. For the record, the state I belong in is Wisconsin. That’s a stretch of the imagination considering how cold-natured I am and the fact that I can hardly be dragged over the bridge to Bluffton, much less out of South Carolina. Maybe the Buzzfeed geniuses need to go back to the drawing board on that one. For more information on the Myers-Briggs Type Indicator, visit myersbriggs.org. Get to know Dr. Zannah Hackett at theultimatelifetool.com. Dr. Hackett will be holding a community educational session on Thursday June 15 at 7 p.m. at the RE/MAX Island Realty Office, 24 New Orleans Road. For information, please call Stephanie Cauller at (843) 785-5252.